The shear nature of hotels and conferences produces waste. From the mini shampoo bottles and plastic name tags, to the copious number of drinking straws, to the endless paper brochures and maps; if you have that many people together in one place, you’re bound to produce some garbage. The last thing I expected to find in this land of extravagance was a full-blown recycling program. When I first arrived at the hotel at Mandalay Bay, my keen, green eye caught sight of a recycling poster advertising that all of the hotel garbage cans were sorted forrecycling. 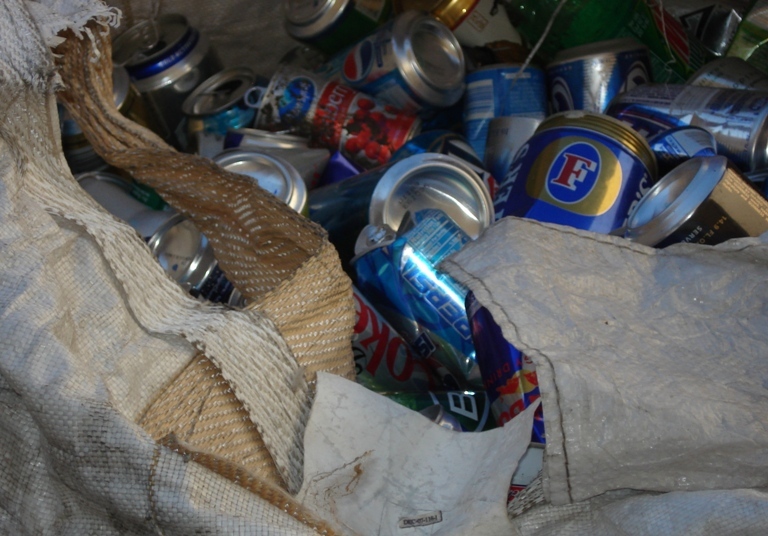 “Hmmm,” I thought (ever cynical), “I wonder what they mean by ‘recycling'” as I pictured someone fishing a couple of beer bottles out of the can and leaving the rest for the landfill. So, during a lull during the last day of the conference, I made my move. Up until this point, I had been starting to panic about the amount of waste I had been producing on this trip. Right off the bat I had forgotten my water bottle at home, so I compromised by buying juice in a glass bottle that I could refill over and over. Most restaurants did have cloth napkins and real silverware, and I had successfully used my Tupperware container at quite a few restaurants, but I had also accumulated quite a collection of plastic straws (why is it so hard to order a drink with no straw? ), apple cores, and limes (those gin and tonic garnishes get you every time). I knew I could recycle my plastic and paper, but there was no way I could take compost on the plane back to Canada. My boss suggested I create a private compost in one of the hotel’s potted plants. Luckily, I was staying at the right place at the right time. After navigating through the concierge, front desk, and conference office, I was introduced to Daniel Smith, the Recycling Manager for Mandalay Bay. He graciously treated me to a private tour of their facilities (thanks Daniel). 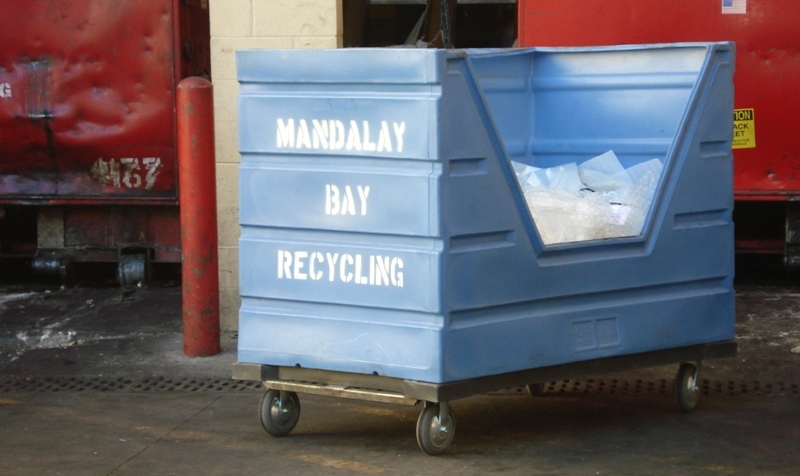 Mandalay Bay is the only hotel on the strip with an extensive recycling program. It was only implemented within the last year or so and is running as a pilot project for all the resorts owned by MGM Mirage. 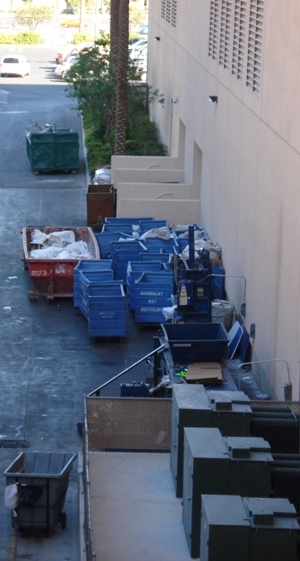 Mandalay Bay diverts over 74% of conference waste from the landfill and saves loads of money in the process. 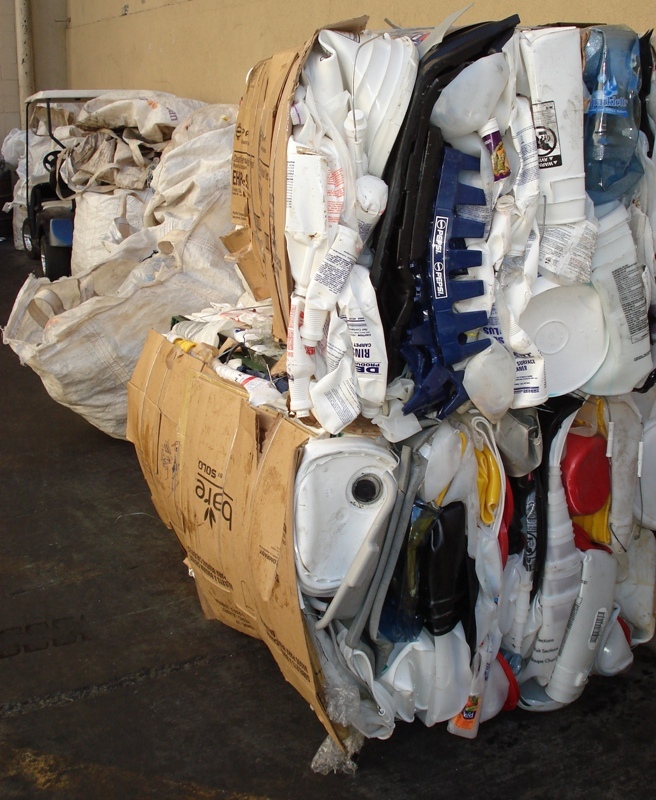 Compare the cost of $50 to take 1 ton of garbage to the landfill to $22 to take 1 ton of glass to the recycling depot, and you understand why this program is in place. This year alone, this one resort has managed to divert 4,230,360 pounds of garbage from the landfill. That’s right, over 4 million pounds! I shudder to think about the combined garbage flowing from the Las Vegas strip on a daily basis. Daniel took me downstairs to the recycling center they were definitely sorting more than beer bottles. Workers manually separate waste into paper, soft plastics, hard plastics, metals, and different colors of glass. They even recycle bubble wrap and squares of carpet from conference booth displays. Everything gets thrown into huge bags that arrive at the hotel filled with salt for the shark aquarium and are reused as recycling bins. Private contractors pick up the sorted materials and take them for further processing. they take unused conference shwag (messenger bags and pens etc) and find homes for them with needy children. They also started reusing old table cloths by cutting them into polishing rags (something we all do at home but is rarely implemented at a large corporate scale) and reusing internal paperwork as shredded filler for items shipped out of the business center. And what about my compost? The hotel has a compost for landscape trimmings, and they send all food scraps to a local pig farm (which turned out to be more cost effective than large scale composting). Judging by the food I had there, those pigs are eating pretty well! The way that this programs differs from most I’ve seen in Canada is that it’s completely behind the scenes. On the “upper floors” it’s business as usual: no worrying about which bin to put my napkin in, it’s all taken care of for me on the other end. 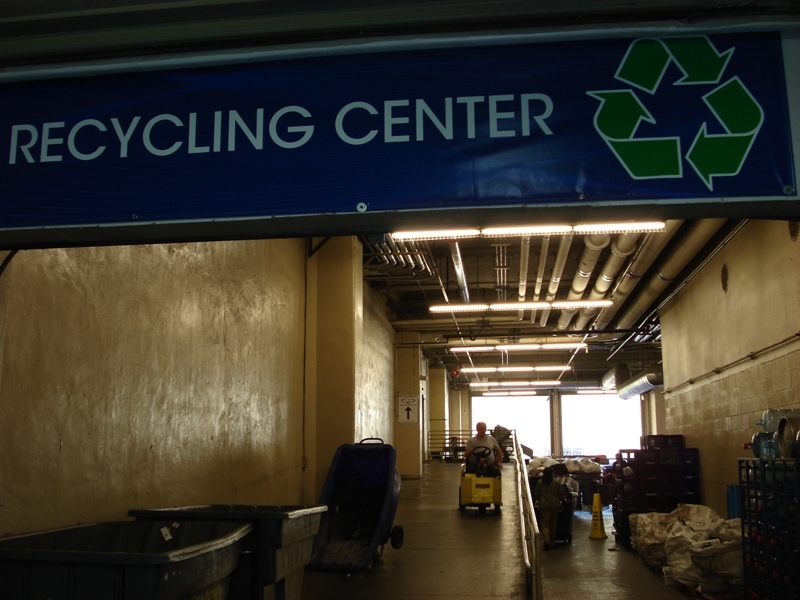 From a service perspective and quality control perspective, this seems ideal; the recycling gets properly sorted by people who know what they’re doing, and the hotel guests don’t have to do a thing which, in Vegas anyway, is the ideal vacation. The program is obviously in its infancy. Independent restaurants are not included in the recycling scheme yet, and I noticed that people who are not directly involved with the recycling program do not even know it exists (2 out of 3 servers did not know what compost was let alone whether they had one). My sit-down conference breakfast had a ridiculous plastic stick with the hotel logo on the end, skewering my strawberry to my orange slice. My boxed lunch (which I declined to eat based on over-packaging nausea) consisted of a cardboard box holding a sandwich in a #7 plastic shell, two condiment packets, a package of chips, a plastic container of pasta salad, a plastic container of chocolate mousse and an apple. Coffee during the conference breaks was served in paper cups. What I’m saying is that I didn’t see a lot of effort to reduce. To be fair, a high end hotel has to have certain (somewhat ridiculous) standards in order to keep all of its stars. For example, have you ever been in a hotel room with less than half a roll of toilet paper? What do you think happens to the last half? It gets thrown out. Mandalay Bay now recycles their unused toilet paper, but they don’t reuse it. Daniel and I had quite a good discussion about reuse, and I hope that by next year they are donating their half rolls to a charity of some sort. It will be interesting to see how this program develops over the next year or two. My guess is that it will be implemented at the other resorts simply because it’s cheaper to get rid of sorted materials than mixed materials. But I’m more intrigued by how reduction and reuse (the first two Rs in the hierarchy) will be received in a society that demands shiny newness at all times, where they knock down buildings more than 40 years old to make room for something better, and where my breakfast strawberry is skewered to my orange slice by a plastic logo. Hi there, I’m new to the whole world of blogging and I’m really excited by the number of Garbloggers there are out there!! I recently ran a small conference (220 attendees) here in Norfolk in the UK. As the conference was about waste we made sure that we did everything we could to reduce the amount of waste created by the conference and our delegates and also took all the steps possible to reduce the carbon emissions of the conference and our delegates. This involved printing our flyers and delegate packs on recycled paper, reducing the amount of paper in the delegate packs, providing recycling facilities at the conference, sending invites out by email, having online booking facilities and providing all presentations online so they do not need to be printed. To reduce the carbon emissions of the conference, we made sure that there were plenty of public transport routes to the conference centre, we promoted lift sharing and will offset all the travel of delegates. We also used a caterer that used only locally sourced seasonal food to reduce food miles. We were lucky that our conference centre also produced it’s own heat from greenhouses so that helped keep our emissions down too! The conference badges have been reused from last year and will be used again next year!! This is still an unusual way of running a conference, but hopefully we will see more and more event organisers heading down this route in the future! That’s great Kate! One of the next conferences my company is attending is a “Green” conference, so I’m going to forward all the things you guys did in hopes that they will follow suit! Also, welcome to the blogosphere. I’m pretty new myself, but have found the number and quality of resources out there quite amazing! Thanks Jen! The feedback we had from the conference was great and no-one complained about the lack of presentation print offs in the pack. This made a huge difference to the amount of paper in the delegate packs. I think as long as you can send hard copies to those with limited internet access there are no problems! I hope the conference takes up a few of our ideas!